First off – i love Joelle Charbonneau – after reading The Testing series i fell in love with her take on dystopia and this new book (series maybe?) is right up my alley. Like the summary above says, the question that’s being posed really is what will get teens to act, do they know the difference between a want and a need and what lengths will they go to fulfill those? In this book, each chapter is a different character’s story – granted there are maybe 10 characters that we follow so the chapters alternate as we get their stories on how they are fulfilling their tasks to get what they feel they ‘need’. The interesting thing here that is part of it all is that Kaylee – our main character – she’s truly the only one who’s submitted a request for a ‘NEED’ and not a want. To back up – her best friend Nate is over at her house one night and introduces her to a website that he found from his brother Jack – this site asks you what you think you need and in return the initial ask is just to invite friends. Nate’s brother got a new phone, and that’s all the prompting that Nate needs to get on the bandwagon. The issue of course though is that once everyone in the school has been invited and has joined, the ante is upped and there are more severe requests to be fulfilled to get what you need. (which in most cases is just a want). So nate gets Kaylee to join, and her ‘need’ is an actual need – to find a kidney for her brother who’s sick and as a result, she’s not asked to fulfill a task since it’s an actual NEED. Through the process of this story – we see how Kaylee’s interactions with everyone manifests, and we see how everyone else in town is willing to do whatever they are told without real question – even if they wonder what the consequence will be. In some cases it leads to murder and death, in some cases it leads to just destruction and fear. The question that we’re forced to ask is who is behind NEED and what’s their real motivation. Why are they giving kids things that they ‘need’ and asking for these awful tasks to be done. Will we find out and what will that mean? We also see that Kaylee’s looking for her father – and you have to know that something there is not going to end well. It wouldn’t be such a focal point of her story if it were going to be good – so i think that the build up there was one that was done well. Where we net out in the end is some what of a bit of closure yet a bit open ended as well which is why i wonder if we’ll get another installment. We see that we’re able to identify who was behind it all but there’s a lead in to something more drastic to come and i wonder what that’s going to mean for everyone in town and elsewhere. SO on that note, yet another winner from this author and i hope that you guys get a chance to track it down. I have to thank my friends at Netgalley for hooking me up with this one – and if you can’t get it now, keep an eye out for it when it’s out in stores! The stakes are higher than ever—lives of promise cut short or fulfilled; a future ruled by fear or hope—in the electrifying conclusion to Joelle Charbonneau’s epic Testing trilogy. Ready or not…it’s Graduation Day. I really enjoyed the finale to this series. While i compared the first installment to THG i think that the path that our lovely author took was VERY different and really impressive. In this third and final installment, we see that Cia has to figure out who to trust, how to get things back in order and understand what that means for her and her friends. As you remember from the 2nd book, Cia has an internship in the President’s office and this means that she’s privvy to certain information. The challenge also means that it makes her a target for the rebels since she knows more than she should. What we get in this story is the journey that she goes on to understand who she’s grown into, trusting her instincts or trusting the people who are in power, and then understanding what to do with it. While the other stories gave us the journey of getting through the phases of testing and trying to survive in the university, this story takes us on more of a survival tale, keeping herself safe while trying to help do the right thing for the commonwealth. Ms. Charbonneau does something great here – she makes the supporting characters really important and we get to learn more about them in an unobtrusive way. We continue to see Tomas in the same light that we always have, although is feature in this story was maybe less so than in the past – he’s really supporting – and more of a tertiary character. Raffe on the other hand – we get to know him a lot more, and i think that we’re constantly challenged to understand which side he’s on. Enzo and Will are the same in this story as well. They play important roles, but again, Cia’s challenged to understand who can be trusted and what their motivations are. The other one – Ian – well i think that we began to see what he was in the 2nd book when we were really introduced to him and while he’s in book 3, he’s not as major as i would have expected. 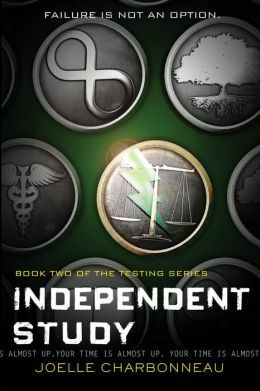 Through the course of this book, Cia learns things about herself that she didn’t know, her journey and she begins to uncover the secrets of the Commonwealth and what the testing is about. I think that I began to question whether or not i was on the ride side of believing things as well, and those characters (the politicals) that i felt were right before, well, i wonder still if they are. At the end, there’s a lot of death, to be expected when rebels are involved, and i think that some were necessary and some were not. I’m still quite sad about one of the deaths, since i think that maybe that person deserved a different ending, but the sacrifice that was made seems justified so i guess it wasn’t for naught. (like the word there?) The others, well i think that we knew many of those would not see the end of the book. We get some of the closure that we were hoping for, but i’m still not sure what’s to be in store for the future. the one miss that i find with this book is that there wasn’t an epilogue. While we get a final chapter, it’s not really what i was hoping for – it gives us a glimpse about 3 weeks into the future, but nothing substantial and that’s really the one thing that i would change. we’ve become accustomed to fast forwards in this genre, and i was hoping that we would get that here. Oh well. In the scarred and war-battered United Commonwealth, ten-year-old Cia Vale watches her older brother Zeen dream about being chosen for The Testing. He’s graduated at the top of his class, and being chosen, like his father was before him, means a chance to attend The University and help lead the effort to revitalize postwar civilization. Cia is conflicted—she hopes Zeen is chosen, but dreads him leaving home. She also realizes that one day she too must set her mind on being chosen. But does she realize the deadly path she will have to take? i’m always one for a different POV or a novella of a book that i’ve enjoyed so this was a nice chapter or 2 for us to read – getting a bit of the fore-shadowing of the story. it kind of makes you hope that there’s more that we get to learn about with Zeen and i kind of hope that we get to read a full story on Zeen and see what he can do for the commonwealth or for whatever cause Cia and ‘their side’ is on. Think Hunger Games but….maybe a bit ‘dirtier/edgier’? I’ve had this book in my elibrary for quite some time now, and i’m not sure what my hesitation was in reading it. Let’s just say – HANDS DOWN THRILLED that i read it finally. 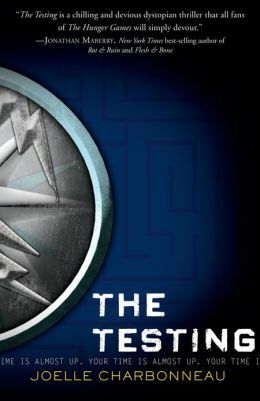 I’m not one to draw similarities among books, but i’m sure that anyone who reads this first book of the series will see that there are comparisons that can be made between The Testing and Hunger Games. That being said, i still really enjoyed it. Taking place in the future, after the world has self destruct through a variety of bombings, and 7 horrific feats (some man made some natural sort of) and the population is only bits of what it was, and are scattered around the country in ‘colonies’ . Tosu City places the capital role here and where all things governmental stem from. We meet Malencia a 16 yr old on the night of her graduation from ‘high school’ i suppose when things are going to change for her. She’s from a smaller colony where for the past 10 years or so at least, no one has been selected for the Testing. it’s odd, but i suppose it happens right. there are rumors that an official from Tosu City will be at the ceremony which makes people wonder if one of the graduates have been selected. i believe that there were maybe 14 kids in the class so the liklihood of Cia being the one, well, surprisingly higher. While no one is selected at the ceremony, we soon learn the next day that not only has 1 person been chosen, but 4 have. Thomas, Malachi and Zandri. This story that we follow in The Testing centers around the relationship that Cia and Thomas develop both on an emotional level and really just to survive. 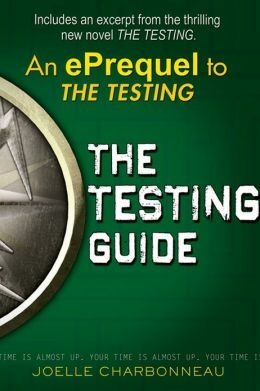 The Testing is a series of survival tests, to see who has the skills to reinvigorate the world, to develop things that seem lost, and to lead the continent into the future as a power. The question really becomes what are they looking for in the future of the United Commonwealth, and do either Cia or Thomas have what it takes. and is someone a pawn? Throughout this story, similar to what we saw with Katniss in THG, Cia is quick to notice when things aren’t always what they seem and uses it to her advantage. She’s an honest player and competitor, and that works for her benefit. The folks that she meets on her journey just add to the confusion and tease what we hope to see in the next few books. Michal for sure, the gray haired man from the journey – Zeen and her father – all people that i can’t wait to learn more about and how they affect things. 5) what’s the motive behind everything? who can you trust.